"What does security mean to you? If it means confidence and certainty in these troubled times, then you've come to the right place. Our vaults provide a level of protection unparalleled in other institutions." 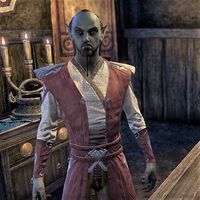 "House Hlaalu maintains this fine financial institution. Your gold and precious goods won't find a safer home anywhere in Tamriel, I give you my word on that." "So many strangers of late. I suppose Lord Vivec's light draws the curious much the same as a flame attracts moths. Would you care to use our services?" "Peace of mind. That's not something you can put a price on. Our vaults provide that and so much more. I'm certain you agree." This page was last modified on 5 May 2018, at 00:41.